Additional GPS Information: How to transfer custom maps to the Garmin Oregon, Dakota, Colorado, Montana, GPSMap 62, and other compatible GPSs. Most of Garmin's newer GPS models include a feature called "Custom Maps". 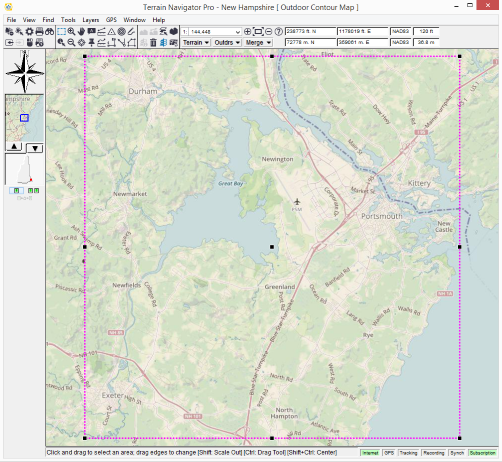 Terrain Navigator Pro can create and manage these custom maps from USGS topographic maps and Aerial Photos, allowing you to use the same high-quality maps on the computer and GPS screens. Use the GPS Setup Wizard (found in Terrain Navigator Pro's GPS Menu) to configure the connection between Terrain Navigator Pro and your GPS. If the GPS wizard fails, you can establish the connection manually by opening the GPS menu in Terrain Navigator Pro, choosing Setup, and selecting the manufacturer (Garmin) and Unit (Oregon, Montana, GPSMap 62, etc.) that best matches your particular model. Note that there are two settings for the Oregon. "Oregon x00 Series" refers to the Oregon 200, 300, 400, and 500 models. "Oregon x50 Series" refers to the Oregon 450, and 550 models. Connect the GPS to the computer. If prompted (on the GPS) to go to Mass Storage, press Yes. The GPS screen should now show a picture of a GPS plugged into a computer. Next, in Terrain Navigator Pro, open the map (or aerial photo) you wish to send to the GPS. Open the GPS menu and choose Send to GPS, Send Current Map. Give the map area a name and press "Send to GPS." The map area that was on the screen will now be in the GPS's memory, and ready for use on the GPS. Note, there is a shortcut for sending the active map to the GPS: right-click on the map and choose Send Map to GPS. Note that only a few map types can be sent to the GPS. These are: USGS Topographic (Standard, Shaded and Collared editions), Aerial Orthophoto (any edition), and Terrain Shading Only. Merged maps can not be sent to the GPS. If a non-exportable map is in view, the option to Send Current Map to GPS will not be allowed. Once the area has been defined, and the map type/scale set, open the GPS menu and choose Send to GPS, Current Map. (Or right click on the map or selected area, and choose Send Map to GPS). The Save GPS Map window will appear. In the Save GPS Map window, you can also specify if you wish to have your layers (makers, routes, tracks, etc.) embedded into the GPS map. For example, if you have used Terrain Navigator Pro's track tool to draw a trail on a topographic map, you may wish to have that trail always displayed on the GPS's version of that map. Embedding this layer allows you to do so. Note that all layers currently visible (as specified in the Layer Size/Visibility preference) will be embedded. Thus, if you want to have some layers embedded, and not others, use the Layer Size/Visibility preference to set up your map display to match. Terrain Navigator Pro can also include a GPX file of Markers, Routes, and Tracks along with your GPS Map. The Manage GPS Maps window presents a list of the maps you have created (using Send Map to GPS.) When you send a map to the GPS, a copy of this map is kept automatically by Terrain Navigator Pro. This can save you time in the future, should you need to remove custom maps from the GPS. The left side of the Manage GPS Maps window shows the maps that you have created in Terrain Navigator Pro; the right side shows the maps that are currently stored on the GPS. To send a map to the GPS, highlight it in the list of Available Maps, and press Send to GPS. The list of Available Maps also has buttons that allow you to Delete the selected map, retrieve Information about that map (such as its scale, dimensions, and number of tiles), Rename the map, Export the map (as a KMZ file for use in other applications), or to Send the map to Google Earth for viewing. Use these buttons to manage your collection of custom maps right within Terrain Navigator Pro. The list of Maps in GPS can be configured to show the maps in the GPS, on the external memory card, or both. Unless otherwise specified, maps sent to the GPS will automatically be sent to the external memory card (if installed.) You can also remove the maps from the GPS and get Information about the selected map. A brief video tutorial on sending maps to a Garmin GPS unit can be found on our YouTube channel. Tiles are portions of map data. On a 1:24,000 USGS topographic map, one tile can cover just over 3 square miles. (Other map types and scales will vary proportionately.) Garmin has placed a restriction in most of its GPSs that only allow 100 tiles of custom maps to be displayed. (The newer Garmin Montana features a 500 tile limit.) It is important to note that this is not tied to the memory of the GPS, but rather its processing ability. Terrain Navigator Pro does not create this restriction. If you prefer to think about your storage in terms of the number of 1:24,000 topo quads you can store on a Garmin GPS, the typical quad is 54.5 square miles. This yields a capacity of 18 quad sheets on GPSs with a 100-tile limit, and a capacity of 90 quad sheets for those GPSs (such as the Montana) that have a 500-tile limit. While we have added many tools within Terrain Navigator Pro to create and manage GPS Maps for use with Garmin GPSs, we know that there are instances where you may wish to manage the maps yourself, or use some advanced features for map creation. Thus, in the Printer/File tab of the Print window of Terrain Navigator Pro, you can specify the export of KMZ files. For best results, set the Preview window to "Export Preview". Also consider starting with the Map Only template. Once you have designed your custom map, press Export. On the GPS, the maps should be kept in the \Garmin\CustomMaps folder. This folder can not be reassigned elsewhere. You may want to consider using your smartphone instead of (or in conjunction with) a handheld GPS. Your Terrain Navigator Pro subscription includes access to the TNP Mobile App and features the same maps and photos offered on the PC desktop.